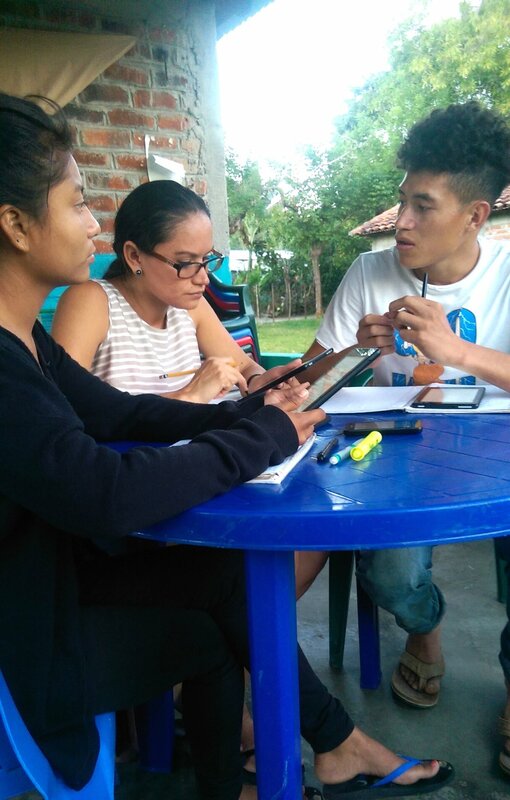 Lorena Mejia (middle), Doris Mercado (left) and Orlando Pineda (right) are taking an online class regarding Methods of Teaching taught by team members Betsy Johnson, Ben Reese and Rafael Reyes.Via the communication application WhatsApp, discussion with instructors involves their assigned readings, homework and volunteering in local classrooms. Lorena Mejía and her husband Antonio have served as cooperatives with our LA Team since early 2016. Together they are responsible for facilitating ministry efforts on our Salvadoran campus including children’s ministry, youth ministry, student-internship program and managing the implementation of our agricultural program. The Mejías are also receiving biblical and occupational training from G.O.D. Int’l. Lorena reflects on her most recent class pertaining to teaching methods here. I am currently enrolled in a class with facilitated reading and discussion regarding methods of teaching proctored by Betsy Johnson, Rafael Reyes and Ben Reese. I’ve learned so much from this experience because it is interactive. We learn effective methods and are able to put them into practice. Interacting with experts in education is a great opportunity for me. Ever since I felt a call from God to serve others, especially in the realm of education for children and youth, I have felt the need to prepare myself to help in the best possible way. For many years I asked God to send people willing to teach me so that I could later instruct others, in the same way Paul taught Timothy so that he could instruct others. God's response has been so great, and I am currently learning about different ways of teaching that can be implemented to achieve a better impact on the children. Doris was excited to participate in our Recursos Conference in October 2018, where she helped with hospitality throughout the event including welcoming and registering each of the almost 200 attendees! I have been a student of the traditional education system in El Salvador. I can say that it really it is necessary that new teaching methods be implemented and that teachers be equipped, because the methods that are currently used are not very effective and students are not learning. Education should be more than listening and sitting still. Students need to develop in a way that is more participatory and interactive. I believe in the capacity and potential that everyone has to learn. I also believe that it is necessary to teach alternative approaches to education for the development of the student community. Doris and Orlando, interns at our Salvadoran campus, both want to become teachers and are also taking this teaching methodology class. Orlando reflected, "God is opening my eyes to see the need to teach and has changed my life to wanting to be a teacher." We are all taking this class because we have a real conviction that students in schools can open their minds, that they can acquire the ability to think, they can develop their skills, and they can express themselves in a participatory manner with others, as has happened with us. 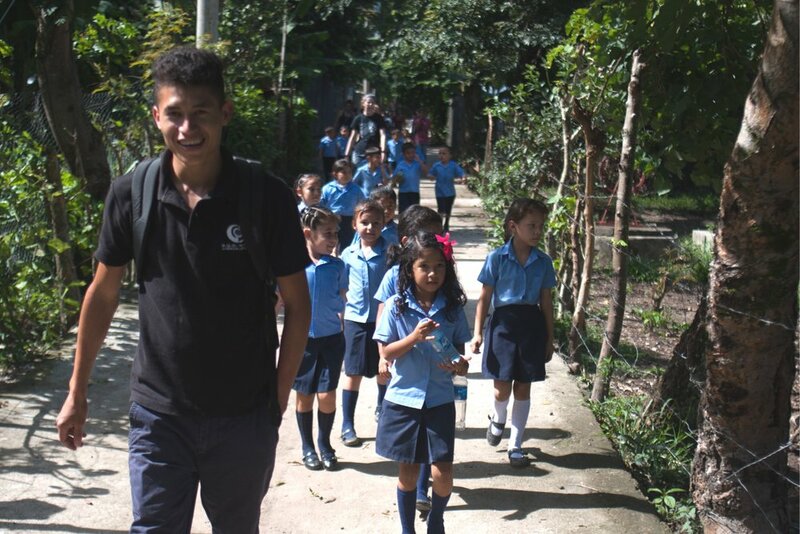 Both interns volunteer 8 hours each week at the local school near our Salvadoran campus. Orlando (pictured here walking with a Kinder class) teaches guitar for level 4 using both his growing interest that is being spurred on by this class. I love learning and teaching, and I have felt empowered as a student of this necessary area of education. Each subject learned in these classes for educators becomes a tool for me and makes me more confident in myself to teach and implement these methods, and develop more my creativity and enthusiasm because I know I am growing greatly. I have good teachers who are models for me, and by being trained, I can teach others who are also struggling to teach effectively. Social change through teaching others to think critically is possible. Little by little skills are acquired that help everyone's development. I am grateful for this opportunity that I have because it compels me to continue learning and it is the way in which God is using me to serve others.